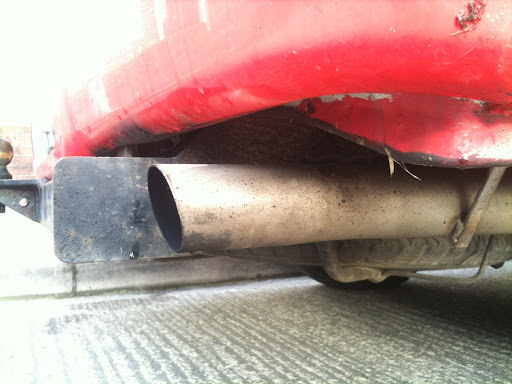 My exhaust tail pipe developed holes, and finally broke just beside the rear mud flap. It must have been getting sprayed with water there as everywhere else it's solid. Just shows you how the rust can get a grip and destroy things. 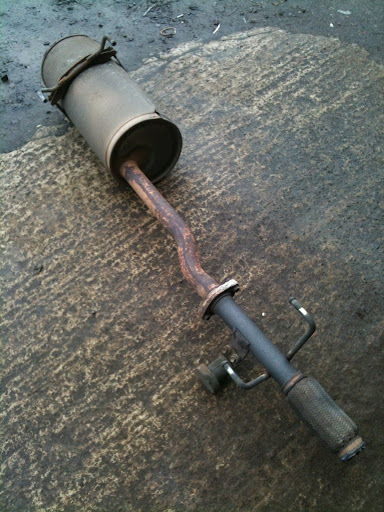 After a couple of days with it held together with a tin can and two exhaust clamps I headed up to Dee's Exhausts in Newtownabbey. 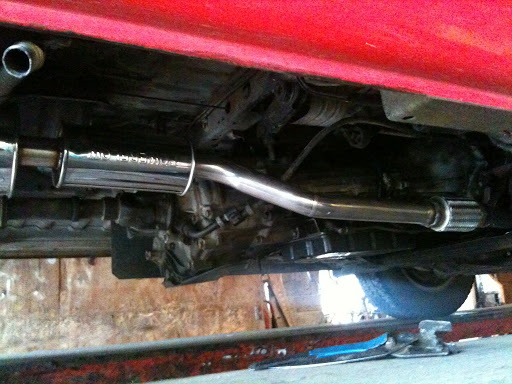 Dee is a Powerflow supplier, specialising in custom stainless steel exhaust systems. I've had work done there before and always been more than satisfied. I finished my nightshift, had breakfast, and coffee in hand, called round to show him the van and arrange a date. As it turned out I was there at a good time so a price was agreed and the guys got to work right away. I stayed to watch and learn from the proceedings (I'd nowhere arranged to go during the couple of hours it would take). This done the guys stopped for a cigarette and coffee, and meanwhile managed to help out an old lady with a flat tyre, and weld up a builders thrashed wheelbarrow (there was a site next door). I had a good inspection of the underside of my van for damage/rust and its looking good. I noted a couple of places that I missed with the waxoyl, so I'll get to that asap. 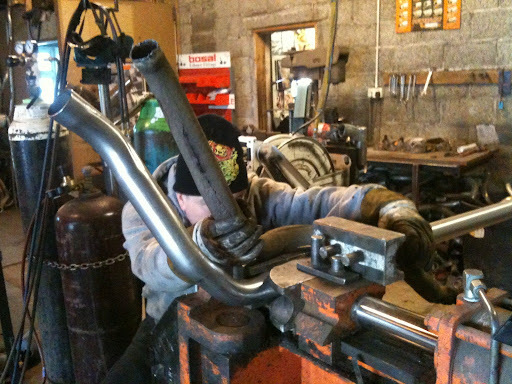 We decided to make it in two pieces and step up the diameter from 2" to 2 1/4" at the rear to improve the look of the visible tail pipe. 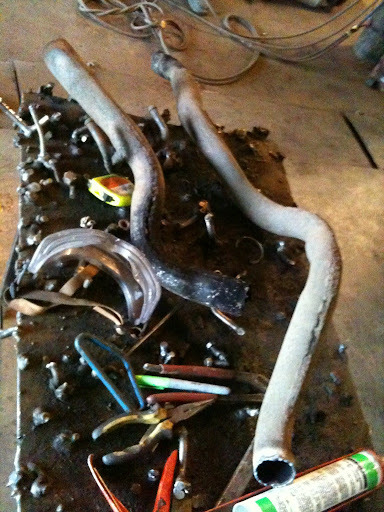 I browsed the selection of end pieces in the storeroom but we finally decided that leaving the plain pipe and adding an angled slash cut would be most in keeping with the simplicity and Japanese origin of the vehicle. Going out for my first drive, I was really pleased with the exhausts sound and there is definitely a noticeable improved performance under acceleration, due to the less restrictive flow of the design. When idling the engine now produces a pleasing throaty rumble which is an added bonus. To celebrate I headed off for a bit off greenlaning further along the coast at a location I'd picked out on google maps the night before. 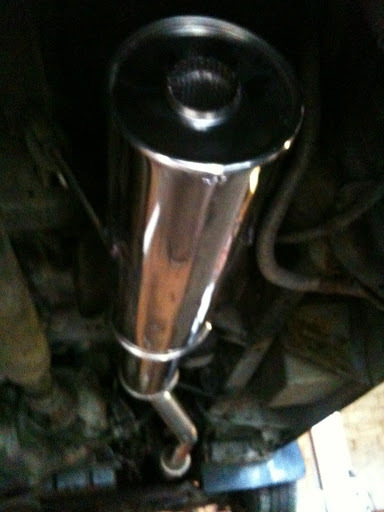 Link to Dee's Exhausts coming soon on the links page.